The 2011 election, however, was set to break the mould of state politics in Rhineland-Palatinate. The SPD was entangled in a host of scandals and seemed therefore bound to pay the price of being in government for two decades. The CDU, on the other hand, had appointed a young and promising new leader but were still struggling with its distant and more recent past. The Liberals, who before 2006 had not been out of government for two decades and had come to see the state as a stronghold during their wilderness years in the 1990s, tried to market themselves as a necessary “corrective” to single-party government and hoped that they could again assume the position of a kingmaker, but were suffering from their very negative evaluation at the federal level. Conversely, the Greens, historically rather weak in the largely rural state,3 rose to double-digit figures in some opinion polls and were expected to benefit from a last-minute swing following the Fukushima Daiichi nuclear disaster that unfolded just days before the election. For the Left, results from opinion polls were too close to call, making the party a wild card. The actual result of the election on March 27 came as a surprise to many observers. The Christian Democrats improved on their last result but only moderately so, while the Social Democrats suffered a massive 10 percentage point loss. Their respective shares of the vote put the two parties on almost equal footing. The FDP and the Left were unable to pass the five per cent threshold so that the Liberals lost their parliamentary representation in the state for the first time since 1983. The Greens, on the other hand, were able to more than triple their 2006 result. While their share of 15.4 per cent may look less spectacular than the 24.2 per cent the party scored in Baden-Württemberg on the same day, it is by far the best result the state party has ever achieved and put them in a position to chose between the SPD and the CDU. Although the evaluation of the federal government’s performance certainly played a role for the final result, particularly for the Greens and the FDP,4the campaign was dominated by state-level issues such as education and regional unemployment. Under the SPD’s stewardship, Rhineland-Palatinate had weathered the ongoing economic and financial crisis reasonably well. In 2010, the state had the third-lowest unemployment rate of the 16 Lander, and the SPD obviously tried to make the most of this fact. In line with previous policy, the SPD government had heavily invested in projects aimed at improving the infrastructure of rural areas and had implemented a number of costly programs to shore up local economies. These programs have contributed considerably to the state’s above-average public debt as well as to the SPD’s political woes. After the 2006 election, the government decided to support the construction of a theme park, a hotel resort and various other attractions that would provide all-season income for the region. 135 million Euros would come from the public purse, while a further 80 million Euros would be contributed by private investors. However, plans for the private-public partnership collapsed with the onset of the financial crisis of 2008/2009. By mid-summer 2009, a complex web of state-backed loans, financial vehicles, forged documents, money laundry, embezzlement and plain incompetence began to unravel. It emerged that the tax payer would have to foot a total bill of at least 330 million Euros, on top of several millions of Euros that had already been paid for lawyers, consultants, and credit brokers. To add insult to injury, the project seems to be riddled with construction defects that further increase the costs. Visitor numbers have remained low so far, yet local family concerns are complaining about state-sponsored competitors that hurt their businesses. In July 2009, Finance minister Ingo Deubel, the self-styled master mind behind the project, bowed to the mounting political pressure and stepped down.8 Separate investigations by the state parliament, the state court of auditors, the public prosecution service, and the European commission are still ongoing, and startling details continue to emerge. At any rate, a blunder of this scale in a part of the Land where the SPD was not particularly popular in the first place would present the party with a major political problem. A separate scandal involving another public-private partnership surfaced in September 2010, just half a year before the election. Karl Peter Bruch, the state minister for Home Affairs, had authorised a seven million Euros payout for the conversion of a listed building into a four-star plus hotel after the private investor had backed out completely. Under the terms of the partnership, this private investor (who happened to be a member of the SPD) was retained as leader of the conversion project, became leaseholder of the hotel and was given an option to buy the place for just 1.4 million Euros after ten years of tenure. The opposition parties called for Bruch’s resignation, but he managed to cling on to his job until the election. To make things worse for the SPD, the scene of the affair was the small town of Bad Bergzabern, where minister president Kurt Beck was born and has his constituency. A final scandal involving the state’s minister for Justice Georg Bamberger culminated in November 2010. Germany’s highest administrative court reprimanded the minister for the way he had handled the appointment of the state’s top judge in 2007, and declared the appointment invalid. Moreover, the court ruled that the minister had violated the Basic Law by not waiting for a pending decision from the Federal Constitutional Court. In this desperate situation, the SPD’s campaign centered very much on Beck, who is currently the longest-serving minister president in Germany (he was first elected in 1994). The campaign highlighted his experience, his personal popularity, and his image as a “Landesvater” who can connect with ordinary people. A second and related motive was the consistent and prominent use of the word “Heimat” in slightly awkward combinations with the government’s alleged achievements (e. g. “home of social justice”). The SPD’s string of scandals provided the opposition parties with ample opportunity for negative campaigning. The Left with its front runners Robert Drumm and Tanja Krauth, however, was unable to campaign effectively in the aftermath of severe internal conflicts that had led to the resignation of its leader, Alexander Ulrich,9 while the Greens and the Liberals focused mostly on their own candidates (Eveline Lemke/Daniel Köbler for the Greens, Herbert Mertin for the Liberals) and their core issues, as each party hoped to form a coalition with the SPD. The CDU, on the other hand, was free from such constraints but had problems of its own. Ever since the palace revolution against the long-time minister, minister president and state party leader Bernhard Vogel in 1988, the party has been beset by internal strife and poor leadership.10 In an attempt to break this pattern, the party elected Julia Klöckner, then a 38-year old junior minister in the federal department for agriculture and consumer protection, as their leader and front runner. Klöckner, a wine grower’s daughter from the Nahe region and former German wine queen, seemed capable of challenging Beck on his own turf. Like him, she is well-versed in the details of policy, yet at ease speaking plainly at parish fairs and wine festivals. Coming across as friendly and approachable, she quickly sidelined her rival Christian Baldauf and managed to project the image of a united party. Pitting this young woman against Beck (then 61) to spearhead an anti-sleaze campaign looked like a clear and effective strategy, and Klöckner played her part with relish. On hundreds of occasions, she lamented the state of public affairs in Rhineland-Palatinate and promised a new start with a CDU/FDP or even a CDU/Green coalition. To drive home their point, the state party put up huge billboards in front of its headquarters that showed the minister president as a sinister puppeteer who controls the “system Beck” from above. But the CDU’s own demons came back to haunt the party. In December 2010, it transpired that Klöckner’s predecessor, the controversial Christoph Böhr, had used 400,000 Euros of taxpayers’ money granted to the parliamentary party to support its work for funding the 2006 electoral campaign. Once a common practice, the transfer of monies from the accounts of parliamentary parties to party headquarters was banned in 1994.12 Within days, the party was given a fine of 1.2 million Euros. Klöckner furiously denied any previous knowledge of the transaction and distanced herself from Böhr. 400,000 Euros may have seemed a small sum in comparison, and the nature of the offence was certainly arcane for many voters, as the money had been intended for the CDU after all. Nonetheless, the affair obviously derailed the CDU’s clean hands campaign. Moreover, it gave the media the opportunity to re-run stories on older instances of misconduct, including the case of one MP who talked his police inspector daughter into supplying him illegally with files on the Nürburgring investigation,13 and the more colourful story of the parliamentary party’s secretary using the party’s credit card for paying in brothels in Berlin and Mainz. The result of the election on March 27 was nothing short of a political earthquake. The share of the CDU increased moderately compared to 2006, but was still the second-lowest in the history of the state party. The SPD, coming from its best-ever result, lost roughly ten percentage points, amounting to almost a quarter of its support in the previous election. They had not done worse since 1959. The FDP lost half of its support and, for the first time since the 1983 debacle, its representation in the Landtag. The Left hardly improved on their 2006 result and again failed to pass the five percent threshold. The clear winners of the election were of course the Greens, whose support more than tripled, securing the party its first ever double-digit result in the state. Turnout increased by almost four percentage points. Where Did All the Green Votes Come From? In the past, the Greens had been very weak in Rhineland-Palatinate. The party was afflicted by internal conflict and a distinct lack of urban, post-modern milieus that let the party thrive elsewhere. Nonetheless, the Greens began to rise in the polls14 as early as April 2010, almost a year before Fukushima, which seems to contradict the notion of a last-minute mobilisation. During the SPD’s autumn of discontent, Green support peaked at 16 per cent which was then seen as unrealistically high. The party’s popularity subsequently dropped to 13 per cent in January, 12 per cent in February and 10 per cent in the last poll that was published before the election, so that the scale of the Green’s success was seriously underestimated. While this was interpreted by some observers as evidence for a last-minute swing – the poll was taken a week before the Fukushima event and two weeks before the election – the five point gap is not much larger than what could be due to sampling error alone. Either way, the party’s large net gain of more than 207,000 votes in an electorate of just over three million eligible voters15 is remarkable, since the structural factors that shape the distribution of party preferences in Rhineland-Palatinate have hardly changed since 2006. Unfortunately, there are no micro-level longitudinal studies available that could shed some light on this unexpected surge. Thankfully, however, the electoral commission for Rhineland-Palatinate publishes electoral results for the state’s more than 2,200 municipalities. While they differ vastly in size – the largest (Mainz) boasts more than 142,000 citizens eligible to vote whereas the smallest (Keppeshausen) has only eight eligible voters – these territorial units are quite small on average, with a median size of just over 500 eligible voters.16 Moreover the state publishes a whole host of additional administrative and spatial information on these municipalities. Taken together, these sources provide considerable insight into the electoral dynamics of Rhineland-Palatinate. 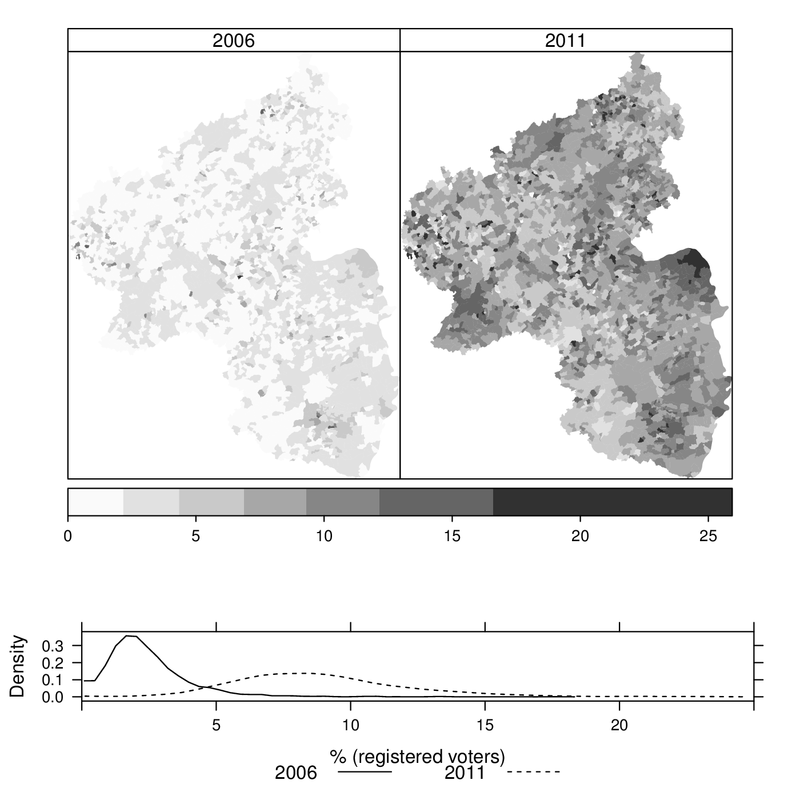 The upper left panel in figure 1 shows the spatial distribution of green support in 2006. Crucially, in most parts of the state, less than three per cent of the eligible voters opted for the Greens. This is even easier to see in the bottom panel, where the solid line represents the right-skewed distribution of Green support across municipalities in 2006. Given a turnout between 50 and 60 per cent, three per cent of the eligible voters amount to less than the five per cent of votes cast required to pass the threshold. In some areas, however, the Greens were strong even in 2006. These include Trier, Mainz, and their surroundings with their large population of students, but also various smaller towns and villages in the Southern Palatinate region as well as the Hunsrück and Westerwald areas. Even in the Eifel region, the heartland of Catholic conservatism in Rhineland-Palatinate,17 there were some spots with unusually high levels of support for the Greens. Like in other parts of Germany, a somewhat unlikely co-operation between urban activists and the rural population helped to shape the character of the New Social Movements,20 from which the Greens began recruiting their members. In Rhineland-Palatinate, however, the ties between the (rural) movements and the party were particularly strong,21 which helps to explain the party’s unusual (and highly localised) support in the country. In effect, the Greens may have appealed to two distinct constituencies in 2006: the small group of urban centres on the one hand, and a flock of small, rural communities on the other. Five years on, the political landscape seems to have been thoroughly transformed. Only in four municipalities have the Greens actually lost votes. Since these are tiny villages with only a handful (39-134) of eligible voters, random fluctuations certainly play a role here. In 95 per cent of the municipalities, the Greens have at least doubled their share of the vote, and in half of them, support for the Greens grew by a factor of four or more. As a result, the distribution of Green support is now symmetrical and roughly bell-shaped, as can be seen the bottom panel of figure 1. At the same time, the variance of Green support has vastly increased since 2006, from 2.6 to 11.0. Although support for the Greens has grown considerably, this is by no means a uniform trend. Somewhat surprisingly, the best predictor for the increase in votes for the Greens is their result in 2006. On average, the party won an additional 0.3 percentage points in 2011 for every per cent they had won in 2006. Moreover, the party’s gains were considerably higher in the better-off municipalities. According to the model, a 100 Euro increase in a municipality’s per capita share of income tax receipts is associated with an additional gain of 0.6 percentage points for the Greens.24 On the other hand, the party improved less in municipalities with higher shares of senior citizens:25 A one-point increase in the population over 65 reduces the expected gains for the Greens by 0.1 points. Finally, even when controlling for all these factors that are associated with past Green successes, the Greens won disproportionately in the state’s five university towns and their immediate surroundings, thereby further increasing the gap between urban centres and rural areas.26 The effect of a given municipality’s location is represented by two variables: A binary indicator for the five university towns themselves plus the logged straight line distance from the nearest university town27 for all other places. Their joint impact is illustrated by figure 2. Taken together, the findings from the regression model point to a sizable Matthew Effect: While the Greens increased their votes across the board, they won more additional votes in areas where they were already relatively successful in the last election, and made record gains in municipalities that had been strongholds in 2006. One can, however, correlate these gains and losses strictly at the aggregate level, without reference to individual voter behaviour. Accordingly, the exploratory model was augmented by two additional variables, i.e. the increase in turnout and the losses for the SPD. As it turns out, both variables have a very moderate effect on the increase in the Green vote. On average, the Greens improved more in areas where turnout increased, and where the SPD suffered disproportional losses: For an increase in turnout by one point, the model predicts a 0.2 point increase in the Green vote, while a one point loss for the SPD is associated with a 0.3 point increase for the Greens. Even these small effects should be interpreted with caution, as the zero-sum nature of electoral competition implies a certain degree of correlation between parties’ games and losses. In the week following the election, the Green leadership held separate meetings with both their CDU and SPD counterparts to discuss the prospects of potential coalitions in confidence. While the Greens claimed that the formation of a Red-Green government was by no means a foregone conclusion, they entered formal talks with the SPD only a few days later. These negotiations were again confidential, and somewhat unusual, very little was leaked to the press. By May 2, the parties announced that they had negotiated a written agreement. The document was then presented to the public and approved by party conferences within less than a week. On May 18, the state parliament re-elected Kurt Beck as minister president for the fifth time. He and his new cabinet were sworn in on the same day. On the surface, the composition of the cabinet reflects the strong bargaining position of the Greens. Eveline Lemke holds a large portfolio that encompasses the economy, climate protection, energy, and planning. She is also deputy minister president. Ulrike Höfken is responsible for the environment, forestry and agriculture – an important brief in a state that relies so much on farming and tourism. Finally, Irene Alt became minister for families, youth affairs, gender equality and the integration of migrants. While these latter policy fields are sometimes disparagingly subsumed under a “low politics” label, they are very close to the heart of the Green party. Moreover, during the negotiations the newly formed department29 has been dubbed a “ministry for future generations” that could help to shape Rhineland-Palatinate’s transformation to a more modern state. One will have to see how strong a minister Alt actually is. The SPD, on the other hand, controls the classic departments. Roger Lewentz, a former permanent secretary in the state’s Home Office, became the successor of his hapless boss Karl Peter Bruch and is also responsible for infrastructure. Carsten Kühl (who had followed his minister Ingo Deubel in much the same way in 2009) continued as finance minister, while Jochen Hartloff, formerly chair of the SPD’s parliamentary group, replaced Georg Bamberger as Minister for Justice and took on additional responsibilities in the field of consumer protection. Moreover, Doris Ahnen (education, science and culture) and Malu Dreyer (benefits, work, health, demographics), who became cabinet ministers in 2001 and 2002, respectively, kept their jobs, although parts of their former portfolios were allocated to Irene Alt’s new department. Finally, Margit Conrad, who had been minister for the environment and for consumer protection since 2001, had to make room for the Greens and is now the state’s permanent representative in Berlin and Brussels. While she (unlike her predecessor) still holds cabinet rank, she does not head a department of her own but rather a unit in the state chancellery. Moreover, the parties agreed in principle to re-asses subsidies for the Nürburgring as part of a larger effort to consolidate public finances. Like all German states, Rhineland-Palatinate is required to reduce its structural deficit to zero by 2020. This will require further painful cuts to public expenditure that will be unpopular with the parties’ respective bases and the wider electorate. Within these constraints, the parties negotiated a 36,000 words “coalition treaty” that, under the slightly convoluted title of “implementing socially and ecologically responsible change”32 outlines their joint programme for the 2011-2016 legislature. By and large, the document demonstrates a large degree of overlap between the parties’ positions in many areas. A brief quantitative analysis of the paper reflects a heady mixture of Beck’s traditional feel-good style with a new rhetoric of dynamism. By far the most prominent verbs are (we) “want” and (we) “will”, which were used about 13 times per page on average and make up almost four per cent of the text. Prominent nouns are “Rhineland-Palatinate”, “Land” and “human (being)”, followed by “extension”. “Support” also features prominently, both as a noun and as a verb. The most frequent adjectives are “strong” and “new”. Somewhat surprisingly, the second most frequently used word of all is the preposition “for”, projecting the image of a coalition that acts on behalf of the common good. For decades, Rhineland-Palatinate appeared as the epitome of political stability, dominated first by the CDU, then by a rather centrist SPD. The 2011 election has dispelled this notion by ousting the FDP from parliament and bringing about the state’s first Red-Green government. One should, however, not discount the impact of unusual events and circumstances that shaped this election. In the years to come, the coalition parties will without doubt face a series of formidable challenges, both individually and collectively. Expensive projects in rural areas, such as the Hochmosel bridge, Hahn airport and the Nürburgring, will continue to be bones of contention for the SPD, the Greens and their respective supporters. Budgetary constraints will further restrict the leeway for political decisions so that distributional conflicts would become more intense even without those massive demographic changes that are already effecting the rural hinterland. Pressure is mounting on Rhineland-Palatinate to invest its dwindling financial resources wisely and strive to retrain its working population in order to become more competitive. The parties, too, find themselves in less than comfortable positions. The SPD lost three of its senior ministers in the run-up to the election. The party barely managed to cling on to power this one more time, and the necessary cuts are bound to further alienate its membership and voter base. Moreover, Beck, who will be 67 at the time of the next election, has failed to groom a successor. At the moment, the most plausible contenders are Roger Lewentz and Hendrik Hering, who was minister for the economy from 2006 and became chair of the SPD parliamentary group after the election, with Doris Ahnen considered to be a dark horse candidate by many. From past experience (e.g. Schröder/Glogowski/Gabriel in Lower Saxony or Vogel/Wagner in Rhineland-Palatinate), it is well known that the transition from a popular minister president to a successor often creates tensions within the party and is rarely popular with the voters. While it would seem that the party’s best option therefore is to solve the issue as quickly as possible, Beck seems unwilling to step down any time soon. In a reaction to claims by the CDU that he was already a lame duck, he declared that he intended to serve for a full five-year term just four weeks before the election,33 a pledge that he renewed in December 2011.34 In the same interview, Beck said that the large number of potential successors was “a luxury problem”. Voters and the party base might disagree. The Greens, on the other hand, have to come to terms with the scale of their success and their distinct lack of experience. It is telling that the three Green ministers hold no seats in the Landtag.35 Höfken is the only member of the Green leadership who is a former member of the Bundestag.36 Alt and Köbler (who became chairman of the parliamentary group) have a background in local politics, while Lemke’s political career was mostly confined to offices she held within the party. Amongst the 18 members of the Landtag that form the Green parliamentary group, only two (Berhard Braun and Niels Wiechmann) were members of the 2001-06 Landtag. Most of the others have had some career in local politics, but two young women (Pia Schellhammer and Anne Spiegel) never held public offices before 2011. An Iranian-German doctor’s (Rahim Schmidt) previous political experience consists of his seven-month spell on a local advisory board in 2009, and a farmer (Dietmar Johnen) only joined the party in 2010.37 While some have worked as parliamentary aides or political consultants, none of the 18 MPs and three ministers has any experience serving in federal or state ministries. Without reading too much into these patterns, it is safe to assume that the recruitment pool was fairly small, that standing within the party and the symbolic representation of social groups played their part in the selection process, and that the Greens will have difficulties in dealing with their SPD counterparts, who are literally years ahead when it comes to government experience. In terms of electoral support, the Greens have become mainstream very suddenly, even in places where they have struggled for decades, and have surged to unprecedented heights in their strongholds. Given the nature of coalitions, it will be very difficult, if not impossible, for the Greens to retain these levels of support. 1Between 1971 and 1987, the CDU won outright majorities and governed alone. See the following for an account of electoral politics in Rhineland-Palatinate: Kai Arzheimer and Cornelia Weins. “Zerfallen die sozialstrukturellen Bindungen an die Union – zum Beispiel in Rheinland-Pfalz?” In: Zeitschrift für Parlamentsfragen 28 (1997), pp. 203–215; Kai Arzheimer. “50 Jahre Wahlen in Rheinland-Pfalz”. In: Politische Kultur in Rheinland-Pfalz. Ed. by Ulrich Sarcinelli et al. Mainz und München: von Hase & Koehler, 2000, pp. 229–254; Jürgen Maier. “Aus Schwarz mach Rot – Der Einfluß der Bundespolitik auf das Stimmverhalten bei Landtagswahlen in Rheinland-Pfalz”. In: Wähler und Landtagswahlen in der Bundesrepublik Deutschland. Ed. by Kerstin Völkl et al. Baden-Baden: Nomos, 2008, pp. 239–261. 2Kai Arzheimer and Harald Schoen. “An Absolute Majority for the SPD as an Unintended Consequence? The Land Election in Rhineland-Palatinate 2006”. In: German Politics 16 (2007), pp. 264–272. 3Benjamin Höhne and Lasse Cronqvist. “FDP und Bündnis90/Die Grünen: Divergierende Ausgangsbedingungen, Entwicklungs- und Durchsetzungschancen im Landesparteienwettbewerb”. In: Politik in Rheinland-Pfalz. Gesellschaft, Staat und Demokratie. Ed. by Ulrich Sarcinelli et al. Wiesbaden: VS Verlag für Sozialwissenschaften, 2010, pp. 164–181. 4FDP front runner Herbert Mertin virtually asked the then-leader Guido Westerwelle not to join him on the campaign trail, as this would make matters worse (Reuters, 18.12.2010). 5See e.g. the league tables compiled by the Initiative Neue Soziale Marktwirtschaft (INSM), http://www.bundeslaenderranking.de/. 6Werner Sesselmeier. “Interessenvermittlung im Wirtschafts- und Arbeitsleben: Gewerkschaften und Arbeitgeberinteressen in Rheinland-Pfalz”. In: Politik in Rheinland-Pfalz. Gesellschaft, Staat und Demokratie. Ed. by Ulrich Sarcinelli et al. Wiesbaden: VS Verlag für Sozialwissenschaften, 2010, pp. 403–413. 10Uwe Jun and Benjamin Höhne. “Das Parteiensystem in Rheinland-Pfalz”. In: Parteien und Parteiensysteme in den deutschen Ländern. Ed. by Uwe Jun, Melanie Haas and Oskar Niedermayer. Wiesbaden: VS Verlag für Sozialwissenschaften, 2008, pp. 341–367. 11Incidentally, FDP leader Herbert Mertin sported a very similar beard. 12Frank Saliger. Parteiengesetz und Strafrecht. Tübingen: Mohr Siebeck, 2005. 14Infratest dimap regularly polls the Rhineland-Palatinate electorate on behalf of public broadcaster SWR. See http://www.infratest-dimap.de/umfragen-analysen/bundeslaender/rheinland-pfalz/laendertrend/ for details. 15Like all German states, Rhineland-Palatinate has automatic registration, so that there is no difference between the numbers of eligible and registered voters. 16For many of the larger municipalities, data are also published at the level of smaller administrative subunits (“Stadt- und Gemeindeteile”). 17Arzheimer and Weins, “Zerfallen die sozialstrukturellen Bindungen an die Union – zum Beispiel in Rheinland-Pfalz?”, op. cit. 18Christiane Leidinger. “11 Jahre Widerstand. Frauenwiderstandscamps in Reckershausen im Hunsrück von 1983 bis 1993”. In: Wissenschaft & Frieden 2 (2010), pp. 47–50. 19Matthias Kagerbauer. Die Friedensbewegung in Rheinland-Pfalz. Der Hunsrück als Zentrum des Protests gegen die Nachrüstung. Unpublished MA Thesis. Mainz: University of Mainz, 2008. url: http://www.pydna.de/MagisterarbeitKargerbauer/Magisterarbeit.htm. 20Ruud Koopmans. Democracy from Below. New Social Movements and the Political System in West Germany. Boulder, San Francisco, Oxford: Westview, 1995. 21Höhne and Cronqvist, “FDP und Bündnis90/Die Grünen: Divergierende Ausgangsbedingungen, Entwicklungs- und Durchsetzungschancen im Landesparteienwettbewerb”, op. cit. 22The increase is measured as the difference between their respective shares amongst the eligible voters. 23To safeguard against outliers, the robust MM-estimator was used, which iteratively weighs down unusual observations to reduce their influence on the final estimates. Postestimation checks show that only eight per cent of municipalities were given weights of less than 0.4. All of these were small in terms of their voting age populations, with a median size of 127 eligible voters and a median electorate of 91 voters. Somewhat paradoxically, electoral results are a poor estimate of the underlying distribution of political preferences in these small communities, as a tiny swing of half a dozen voters would show up as large percentage change. Therefore, assigning less importance to findings from these municipalities makes sense conceptually. In line with current practice, (robust) standard errors were calculated for the coefficients, although the cases are not a sample from any large population. The (robust) R2for the model is 0.23. 24This share is calculated according to a complex formula which involves a degree of redistribution but roughly reflects the economic situation of a municipality’s citizens. In the most recent data, this value varies between 27 and 972 Euros, with a mean of 272 Euros and a standard deviation of 69 Euros. Tax receipts were divided by 100 before entering the model to facilitate comparisons and calculations. 25Here, the mean is 20.6 per cent with a standard deviation of 4.2 per cent. 26The Universities of Mainz and Trier and the Technical University of Kaiserslautern are relatively large institutions with 35,000, 15,000 and 12,000 students, respectively. The state’s fourth university is split across two campuses, with about 6,000 students enrolled at Koblenz in the north and about the same number studying at Landau in the south. Mainz, Trier and Kaiserslautern also feature relatively large Polytechnics, with more (mostly smaller) institutions scattered across the state. These have not been coded separately. 28The long-standing debate on the estimation of voter transition matrices has been revived by recent advances in the field of ecological inference (Ioannis Andreadis and Theoodore Chadjipadelis. 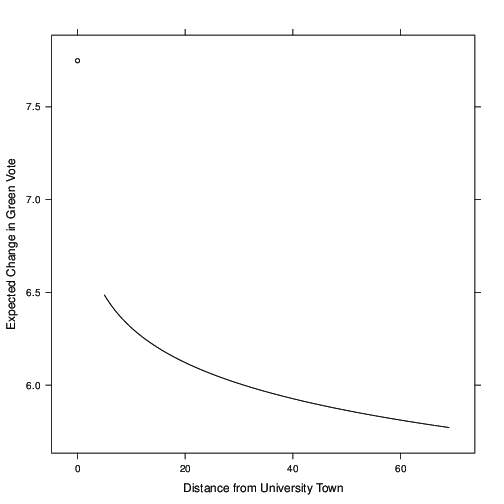 “A Method for the Estimation of Voter Transition Rates”. In: Journal of Elections, Public Opinion and Parties 19.2 , pp. 203–218). These methods are, however, beyond the scope of this article. 29Alt’s department brings together units from pre-existing ministries. Migration, however, had never before been referred to in the name of a department. 30Hannoversche Allgemeine, 28.12.2010, http://www.haz.de/Nachrichten/Wirtschaft/Niedersachsen/Stahlbauer-Eiffel-aus-Hannover-baut-groesste-Stahlbruecke-Deutschlands . 33Reuter Deutschland, 27.02.2011, http://de.reuters.com/article/domesticNews/idDEBEE71Q02A20110227 . 34Interview with dapd, 24.12.2011, http://www.net-tribune.de/nt/node/89118/news/Beck-sieht-Zahl-seiner-potenziellen-Nachfolger-als-Luxusproblem . 35Lemke gave up her seat in the Landtag when she became minister. 36Höfken was a member of the Bundestag from 1994 until 2011, when she gave up her seat to become state minister in Rhineland-Palatinate. 37Information on public offices held is listed on the Landtag’s webpages: http://www.landtag.rlp.de/Abgeordnete/. The duration of Schmidt’s spell on the advisory board (01.07.09-28.01.10) is documented here: http://online.mainz.de/bi/kp0040.php?__cwpnr=3&__cedat=2456839&__cadat=2455014&__cwp=1&__kgrnr=9 .